This Handbook is intended to provide communities with a concise, step-by-step guide to use in developing a CWPP. It addresses, in a straightforward manner, issues such as who to involve in developing a plan, how to convene other interested parties, what elements to consider in assessing community risks and priorities, and how to develop a mitigation or protection plan to address those risks. FRCC is an interagency, standardized tool for determining the degree of departure from reference condition vegetation, fuels and disturbance regimes. Assessing FRCC can help guide management objectives and set priorities for treatments. Landfire is a 5-year, multi-partner wildland fire, ecosystem, and fuel mapping project that will generate consistent, comprehensive, landscape-scale maps and data describing vegetation, fire, and fuel characteristics across the United States. The NCRS has mapped and analyzed the size and extent of the WUI across the United States from 1940 and looking ahead to 2030 to help policy makers, managers, state agencies, and communities reduce current wildfire hazards and plan for the future. The U.S. Fire Learning Network engaging dozens of multi-agency, community-based projects in a process that accelerates the restoration of landscapes that depend on fire to sustain native plants and animals. 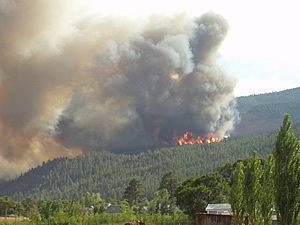 The network is a joint project of the Nature Conservancy's Global Fire Initiative, the USDA Forest Service and the U.S. Department of the Interior. The National Association of State Foresters is a non-profit organization that represents the directors of the State Forestry agencies. Their website provides links to many state forestry websites. The Western Forestry Leadership Coalition is a state and federal partnership. It creates a clear voice on forestry in the West, allows close coordination, optimizes efficient delivery of programs, and strengths our ability to address pertinent issues. The WGA initiative on restoring and maintaining fire-prone ecosystems has a detailed website of information. This website includes a report from a health forest advisory committee and sub-group summary documents on forest and rangeland health collaboration in the West. Resource Innovations, a research collaboration between the Resource Innovation Group and the University of Oregon, provides a program that focuses on building capacity in rural and underserved communities to address wildfire protection, increasing awareness about the relationship between wildfire and rural poverty, and providing resources for community efforts in fire and forest restoration. The Partnership Resource Center provides the online resources needed for building vibrant partnerships and effective collaboration on the nation's forests, grasslands, and other special places. Their website is a joint project of the National Forest Foundation and the USDA Forest Service. Reseachers visited 16 communities across the U.S. to identify steps they have taken to increase community wildland fire preparedness, and the social foundation necessary to support this action. This site contains 4-page case study summaries for each community. Colorado's Front Range Fuels Treatment Partnership is an interagency program that reduces wildland fire risks through fuels treatments that are economically feasible, socially acceptable and ecologically sustainable. The Joint Fire Science Program (JFSP), a partnership of six Federal wildland and fire and research organizations, was established in 1998 to provide scientific information and support for fuel and fire management programs. The goal of FRAMES is to be an effective mechanism for wildland fire technology and information transfer. This site is a "one-stop" fire education source for wildland fire communicators. It is dedicated to providing a widely accessible source of information that promotes the improvement of wildland and watershed health and sustainability in Colorado and the Rocky Mountain area.